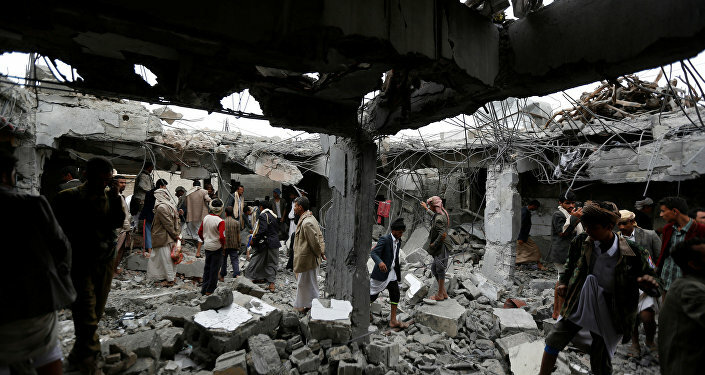 The refusal of the United States to condemn the killing of thousands of civilians by Saudi airstrikes in Yemen is based on Washington’s unquestioning support for Riyadh’s destabilizing policies in both Yemen as well as Syria, US analysts told Sputnik. 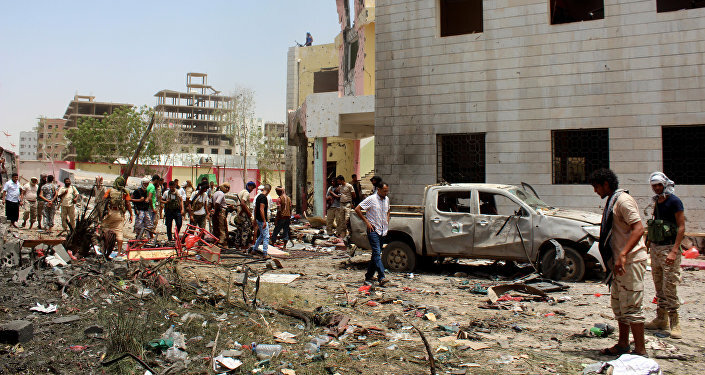 WASHINGTON (Sputnik) — On Saturday, an airstrike in the Yemeni capital Sana’a killed 140 people at a funeral hall. Saudi Arabia has opened an investigation into the incident, but denied culpability. More than 4,000 civilians e have been killed in the Saudi-led airstrikes in Yemen, according to media reports. "There is no double standard," foreign affairs analyst and commentator Dan Lazare said on Thursday. "The United States acts according to a very simple principle. Whatever the al-Saud want, the al-Saud get." On Tuesday, US State Department spokesperson John Kirby was asked repeatedly at a media briefing to answer questions put to him on why the US government condemns Russian bombing in Syria but supports Saudi-led bombing in Yemen, which deliberately targets civilian infrastructure. "If the Saudis want to sponsor Salafist head choppers in Syria, then so be it: Washington will go along. If the Saudis want to bomb Yemeni population centers as part of a misconceived war against Houthi Sunni rebels, then the United States will provide targeting assistance and mid-air refueling," Lazare stated. Since the Saudis are backing the Khalifa royal family in Bahrain, the Obama administration has refused to condemn widely criticized human rights abuses there as well, Lazare pointed out. "The United States holds its tongue about its ferocious crackdown on mostly Shiite democratic protesters. It feels free to criticize human rights violations elsewhere in the Middle East, but knows that it must keep quiet in this instance because that's what Riyadh wants it to do," he noted. Criticisms of the US government for applying a double standard to Russian air support operations in fighting terrorists in Syria and another in allowing the Saudis to continue to bomb civilian targets in Yemen failed to understand the single motive behind US policies in both countries, Lazare explained. "The idea of a double standard is misleading. There is really just one standard, and that is that the US-Saudi special relationship must be preserved at all costs. All other considerations are secondary," he stated. Robert Naiman, policy director at Just Foreign Policy agreed that the US determination to support Saudi Arabia governed Washington’s policies in both Yemen and Syria. "In Yemen, the United States is supporting the Saudis. In Syria, the United States is also supporting the Saudis," Naiman observed. In both conflicts, US policy was guided by the same single standard of backing Saudi Arabia and the forces, however extreme, that it has funded and protected, Naiman noted. "The standard is: on the one hand, we have the crimes in Yemen by our friends the Saudis, which we are actively supporting. And on the other hand… our adversaries in Syria are attacking the rebel groups supported by the Saudis and the CIA. And that is the difference," Naiman concluded.